After a long night out in Madrid, sometimes all you need is a nice midnight (or 2am, 4am, or 6am) snack. A trip to Spain is never complete unless you grab some churros and chocolate. So when you are headed home for the night hungry, kill two birds with one stone and enjoy this Spanish delight. When the time has come to check this off your list, then look no further than the Chocolatería San Ginés just west of Puerta del Sol. This Chocolatería has been serving churros, chocolate, and coffee since 1894 and the best part of the Chocolatería is that it is open 24 hours! The Chocolatería always has a lively atmosphere with people bustling in at all hours of the day and night. 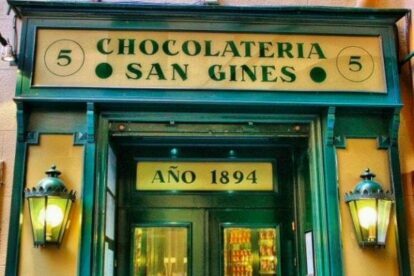 The street, Pasadizo de San Ginés, is authentic and beautiful as many people stop to take a picture with the Chocolatería in the background. The Chocolatería has a lot of history and by 2018 the shop has sold over 5,000,000 churros! This history combined with its central location makes it a must-stop spot. If you want to be a true local then when you finish your churros you must drink the warm chocolate that is left over! Sit, enjoy, and listen to the Spanish language filling your ears as you snack away.